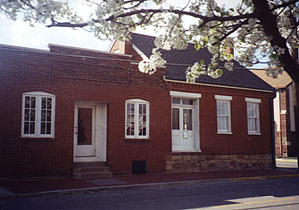 The building which houses the Labor & Industry Museum has four building dates beginning with 1837. Conrad Bornman, believed to be the first German immigrant to Belleville, purchased the lot at the intersection of North Church and East B Streets in 1837. The Museum building, located at 123 North Church St. in Belleville, was originally built in 1837 and expanded in 1870 and 1913. The 1881 History of St. Clair County relates that Conrad Bornman a blacksmith and strawberry farmer who became interested in brick making and the art of bricklaying, and a fellow blacksmith named Small, were the first German immigrants to Belleville. They were the vanguard of the largest German migration to the State of Illinois, and they and their fellow Germans contributed greatly to the 1830’s building boom and to the foundry/industrial “Gilded Age” of Belleville and the Belleville area. 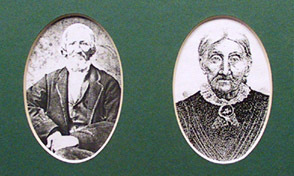 By 1837, Conrad Bornman was 20 years old and had lived in the new world for 19 years. In that year, he built a house at 123 N. Church St. in the town of Belleville - two blocks from the Public Square. It is now the home of the Labor and Industry Museum. When it was boarded up and slated for demolition in 1995, the Historic Preservation Commission noted that it was the last remaining German Street House in the original town of Belleville as platted in 1814. Bornman built his 2-½-room house in the classical severity of the “Klassizimus” Style popular in Germany in the 1830’s and 1840’s . The brick street house is 1-½ stories, with gabled side walls and a cornice of brickwork across the front. The original entry was a single door with sidelights and a transom overhead to catch the summer breezes. The windows are evenly spaced, and the wood lintels are original to the building. The interior of the house has log lintels with the bark still on them. There is a trap door to the cellar, worn pine thresholds and the original stairway and floors. Bornman sold his street house to Charles Born in 1840. Born had emigrated from Germany in 1839 and was a shoemaker by trade -- the 1860 Street Directory lists Born Boot & Shoe Dealer in the first block of N. High St. He also served as a city alderman and city marshal. Like Bornman, Born changed careers and opened a machine shop with two of his sons, John Charles and William F. They lived and worked at 123 N. Church St., and the original house was expanded twice before they built a new machine shop at 222 East B St. in 1885. 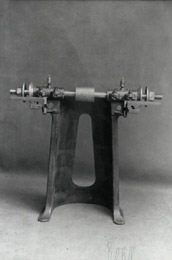 John Charles was the patent holder of six inventions of steam pumps, polishing lathes, and grinders. Charles Born died in 1896, and in 1920 J.C. Born Machine Co. was sold to Columbia Manufacturing Co.
Two of John Charles Born's six inventions. 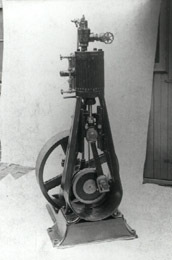 The machine on the left is a steam engine. On the right is a grinder. In 1913, the Born family sold the North Church Street building to Charles Beck, who expanded it to house his cigar and tobacco manufactory. Charles Beck (1867-1933) learned cigar making from Louis Kaemper, a cigar maker at 228 E. Main St. By 1901, Beck had his own shop at 208-210 W. Main St. According to his grandson, Beck fashioned all the equipment used in making cigars, chewing tobacco and pipe tobacco, including a stripping machine, humidor and oven. The giant zinc-lined oven remains in the basement of the museum. The last cigar was made in the building in 1957. 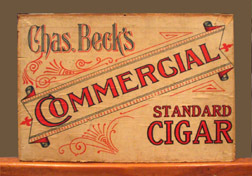 Beck was active in the affairs of the Cigar Maker’s Union and served as its vice president. He was instrumental in the formation of the Belleville Trades and Labor Assembly in 1891 and served as that organization’s first treasurer. Beck’s son, Sonny, closed the cigar business in 1957, and the building was sold to Everett E. Sakasko, who operated Ed’s TV Repair Service. Sakasko’s wife, Geraldine, was the proprietor of the “The Lady Orchid” Beauty Salon. In 1995, the N. Church St. building was purchased by the East-West Gateway Coordinating Council, and the property was to be demolished to provide parking for the St. Clair County Transit District. However, with the cooperation of City and County Government and the Historic Preservation Commission, the City of Belleville Planning Department was given six months to find a use for the building. 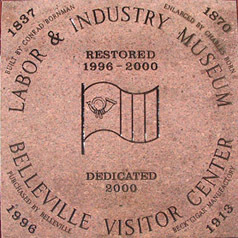 Since Belleville did not have a visitors center at that time, the city determined that that would be a good use for the building, and funds were garnered from Downtown Development & Redevelopment, Belleville Tourism, and the Historic Preservation Commission to purchase the building from the Transit District. Additionally, funds would be raised from the public and private sector to restore the building and house a Labor & Industry Museum. The museum would center on Belleville’s Gilded Age, 1865 - 1929. In 1998, an official board was formed to restore the building and develop the museum. The restored building was dedicated December 2000. Almost 1,400 people attended the Grand Opening August 10, 2002. 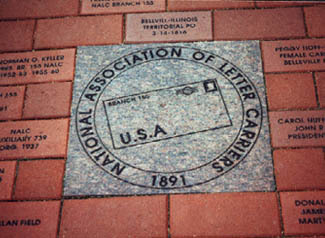 The sidewalk stones outside 123 N. Church Street commemorate important dates in the building's history and honor many associations and individuals involved with the area's labor movement.